Pfizer's quit-smoking drug Chantix has had good years and bad years. But it's closing 2016 on a high note, with the FDA lifting the requirement that the drug carry the dread "black box" warning label following an extensive study of the drug's side effects. As far back as 2008, Chantix has been blamed for heart attacks, strokes, and an increased risk of homicidal and suicidal thoughts and actions. 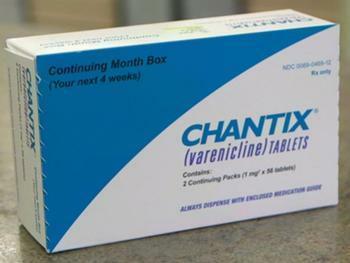 In 2011, the FDA ordered additional warnings on Chantix packaging after a study found a small increased risk of cardiovascular problems. But in July 2016, a study found that Chantix had the best smoking cessation results among women, while its effectiveness for men was less certain. And now what's said to be the largest smoking cessation study of its kind finds a reduced risk of neuropsychiatric effects. In response, the FDA has lifted the black box requirement. The study — EAGLES (Evaluating Adverse Events in a Global Smoking Cessation Study) — found that in patients without a history of psychiatric disorder, Chantix was not associated with an increased incidence of clinically significant neuropsychiatric adverse events in a composite endpoint comprising anxiety, depression, feeling abnormal, hostility, agitation, aggression, delusions, hallucinations, homicidal ideation, mania, panic, and irritability. In patients with a history of psychiatric disorder, there were more events reported in each treatment group compared to the non-psychiatric cohort, and the incidence of events in the composite endpoint was higher for each of the active treatments compared to placebo. Hall noted that smoking is the leading preventable cause of death in the U.S., responsible for roughly 540,000 deaths each year. Stopping smoking has significant health benefits, including reducing the risk of tobacco-related diseases such as lung cancer, heart disease, stroke, chronic respiratory disease and other conditions.